On February 8, 2019, Ariana Grande released her fifth studio album "thank u, next." Ariana Grande performs songs off her fourth studio album "Sweetener" at the Sweetener Sessions. Less than six months after releasing her Grammy-nominated album Sweetener, pop star Ariana Grande released her highly-anticipated fifth studio album thank u, next on February 8, 2019. After a strenuous year that left her name scattered across headlines, Grande returns with what might be her best work yet. thank u, next, named after the song that took the world by storm, is a true reflection of Grande’s insecurities. Grande does more than express and confess with this album: she conquers. 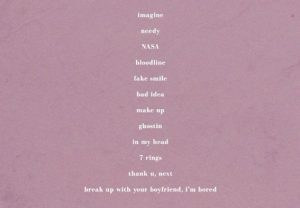 Grande revealed the track list for “thank u, next” on January 22, 2019. “It kind of redefined what a breakup song was, in a grateful way,” stated director Hannah Lux Davis, who worked with Grande for her “breathin” music video, in an interview with Jezebel. Grande’s leading single “thank u, next” is undoubtedly the self-love pop anthem that everyone was hoping for. The song’s bubbly beat complements simplistic but meaningful lyrics, producing an undeniable pop hit. Along with the music video featuring celebrity cameos and Easter eggs alluding to past relationships, it’s no surprise that the single attained 55.4 million views in its first 24 hours on YouTube. Her second single, “imagine,” kicks off the album. “imagine” is a dreamlike song with a slower beat that illustrates Grande’s idea of a perfect relationship. She isn’t afraid to describe something real, pure, and intimate. Although the song is less appealing for radio, the sorrowful undertones of “imagine” portray the fantasy of a perfect relationship. In stark contrast to “imagine,” “7 rings” unsuccessfully debuts Grande’s rapping skills in what is arguably the most disliked single from her latest album. A modified version of “My Favorite Things” from The Sound of Music serves as the background melody, and Grande repeats the lines, “I see it / I like it / I want it / I got it.” Lyrically, the track isn’t particularly unique, and it conforms to common themes in the rap industry—namely, flaunting wealth. At the same time, it’s admittedly a breath of fresh air among the twelve tracks, as it follows more raw, honest songs like “in my head” and “ghostin.” It’s one of those fun, upbeat songs you wouldn’t listen to on a regular basis, but you’ll sing all the lyrics when you hear it at homecoming. Another highly-anticipated track by fans, “needy,” strikes a similar vibe to “imagine.” Grande admits to her emotional insecurities, and her relatable lyrics including “I’m obsessive and I love too hard / good at overthinking with my heart” resonate with listeners. Grande’s request for personal space in “NASA” contrasts the obsessive love detailed in “needy.” Though she deserves praise for her lyrical composition, the chorus is lackluster in comparison to the rest of the track. Grande explains the necessity of time apart in a relationship as she compares herself to the universe: “It’s like I’m the universe and you’ll be N-A-S-A / Give you the whole world, I’ma need space / I’ma need space, I’ma, I’ma need / You know I’m a star; space, I’ma need space.” While the astrological theme of “NASA” does not make up for its simplistic chorus, it remains a fan favorite. Conversely, Grande takes too many risks in “fake smile.” The melody fails to complement the lyrics, changing from a Just Dance vibe at the beginning to a quasi-rap verse at the bridge back to a oversimplified chorus. It lacks a flow that other songs demonstrate almost perfectly. Echoing vibes from Dangerous Woman, the developed melody and darker feel in “bad idea” finishes with a transition from a classical to an electronic end. The instrumentation, though praised as unique, feels disconnected from the song. “bad idea” and “make up” contrast each other— perhaps intentionally, perhaps not —but their compositions are effective to maintaining a balance of emotion in the album. “make up,” unfortunately, doesn’t completely live up to expectations and has been criticized as a “filler” song. Arguably one of her best songs (not just on thank u, next, but across all of her albums), “ghostin” radiates grief and vulnerability: it’s fragile, emotional, and raw in a different way than “imagine.” While “imagine” illustrates a perfect world, “ghostin” expresses a painful reality. The song begins with an eerie but unique tone; Grande’s soft, almost whispery voice floats over the sharper, droning background. Fans speculate that “ghostin” describes how Grande’s relationship with ex-fiancé Pete Davidson was impacted by Mac Miller’s death in September 2018, and that it would have been kinder for Grande to ghost Davidson rather than continue the relationship while still in love with Miller. As the song directly samples Miller’s track “2009,” fans were also quick to notice how Grande’s line “he just comes to visit me / when I’m dreaming every now and then” parallels Miller’s line “been here every night for weeks at a time / you in my dreams that’s why I sleep all the time” from his song “Cinderella.” Grande revealed on Twitter that “ghostin” was the first song she wrote for thank u, next. “in my head,” as a cliche, is the musical representation of the phrase “ignorance is bliss.” The song begins with a voicemail from one of Grande’s close friends, Doug Middlebrook: “Here’s the thing: you’re in love with a version of a person that you’ve created in your head, that you are trying to but cannot fix. Uh, the only person you can fix is yourself. I love you, this has gone on way too long. Enough is enough. I’m two blocks away. I’m coming over.” Grande admits to perpetuating a loveless relationship singing, “look at you, boy, I invented you” and “I did it to myself, yeah / Thought you were somebody else.” A brutally honest confession, the abrupt chorus emphasizes her blindness to reality. Though it has one too many signature “yuh”s, Grande’s “break up with your girlfriend, i’m bored” takes the tasteful features of “7 rings” and combines them with the feminist vibes of “bloodline” and “thank u, next” to create a song destined for radio. Given its music video, many believe the song represents Grande encouraging her past self to leave a relationship in order to learn how to love herself. The track serves as a strong finish to an even more powerful album. Although some songs lack merit in comparison to others, thank u, next tells a story of a woman who rose above heartache and grief to empower herself and others through music. From pure pop hits like “thank u, next” to intimate pieces like “ghostin” to emotional confessions like “in my head,” Grande crowns herself as a queen of pop with thank u, next.